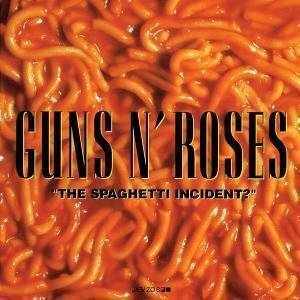 Guns N' Roses release "The Spaghetti Incident?" "The Spaghetti Incident?" is the 5th studio album by hard rock band Guns N' Roses. The album is unique for the band, consisting entirely of cover versions, mostly of punk and glam rock songs of the late 1970s and early 1980s. Many of the tracks were recorded with original Guns N' Roses guitarist Izzy Stradlin during the Use Your Illusion I and II sessions and then were later re-recorded by Gilby Clarke. Those tracks were previously intended to be included in a combined Use Your Illusion album, consisting of three (or possibly even four) discs, instead of the two separate discs they ended up being. In 1992, the band prepared to release the leftover cover tracks as an EP, with Gilby Clarke replacing Stradlin's guitar tracks. They later decided on making the album a full release and recorded several more tracks for it. Bassist Duff McKagan sings on many of the album's tracks and Hanoi Rocks frontman Michael Monroe appears on "Ain't It Fun" as a guest vocalist. "The Spaghetti Incident?" debuted at #4 on the Billboard 200, selling about 190,000 albums in its first week of release, significantly less than their previous releases.